Europe in the the early 20th century was a world changing. Victorian ideals were in decline, and in their place new liberalism and experimentation emerged. The militarism leading up to World War I, and its aftermath, saw the dissolution of empires and new social orders begin. New technologies like radio and cinema, new music like jazz, and art movements like cubism were rewriting the rules on art and entertainment. The rise of Freud’s influence coincided with the thawing of traditional constraints against showing feeling, which led to a freeing of the body and mind. In the early twentieth century the foundations were being laid for the freedoms of thought, politics and movement we have today. Dance was not to be left out of this transformation. At this time Rudolf von Laban, a dance artist and theorist, was working in a movement called Bewegunskunst: German Expressionist Dance. In expressionist dance artists seek to express meaning or emotional experience rather than physical reality. These explorations in dance and movement led to the creation of movement choirs, in which large numbers of people move together in a choreographed manner, but with room for personal expression within the movements. Laban created 25 schools of dance for children, amateurs, and professionals to further the idea that expressive dance can benefit anyone. With Laban as with other modern dance pioneers, men and women danced barefoot in unrestrictive clothing – this in an era when men still wore suits every day and women’s corsets were only slowly on their way out of style. The individuals choice as a dancer, their self-initiated movements, was as important as the choreographers’ – revolutionary when compared to the dominance of the choreographer in classical ballet. To Laban, the movement arts could be free of its reliance on music, the body could find its own rhythms, and traditional steps could be abandoned. The body could simply explore the medium of space without direction or constraint. In addition to creating and teaching dance, Laban wrote extensively, working on his studies of the human body, its movement through space and its relationship to space. 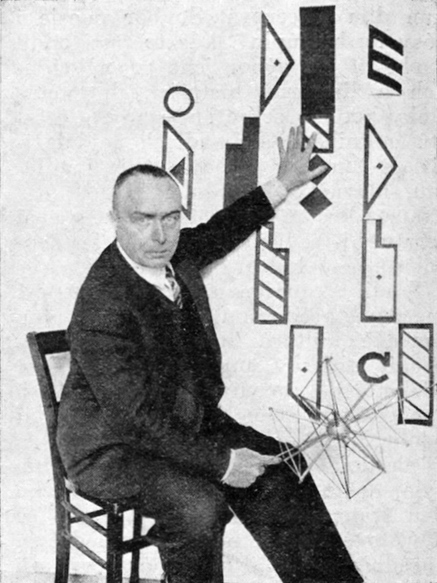 His experiments led him to identify the basic vocabulary of expressive movement. The culmination of his studies came in 1928 with the publication of Kinetographie Laban. This book describes the system of putting symbols on paper that represents body parts moving through space and time dynamically, which we now call Labanotation. Laban’s drive to devise a notation system for dance came from a desire to lift dance as an art form. He believed this was only possible through literacy: being able to write about dance coherently and in a clear language. With Labanotation, as with the standardised symbols of music or literature, modern dance could for the first time be ‘captured’. Works can now be recorded then accurately recreated without the need for the original choreographer and without relying on fallible memory. Students of dance at opposite ends of the world can study and recreate works working only from a score much like a music sheet. Dance works now live on beyond the choreographer, to be analysed and studied as any other artwork is. Laban’s dedication and pioneering work succeeded in establishing dance as equal among the arts. We can thank the Romantics for ballet as it appears to us today. In the 18th century ballet was characterised by, among others, elaborate costumes, abstraction and the use of gesture, and its appeal was limited to the Royal courts of the day. The Romantic era was a reaction to the Industrial Revolution and a rejection of the Age of Enlightenment. The Industrial Revolution was a period of development which saw massive changes in the way people lived and worked. The Enlightenment was a movement which focussed on science, reason, and rationality. Cities were spreading, people were leaving the countryside, and scientific reasoning had taken over from superstition and religious dogma. Romantics, in their attempt to escape industrialism and urban sprawl, idealised and romanticised nature. Imagination, not reason, was considered the best quality of the mind. Romanticism affected every area of life from politics to education, and was most noticeable in the arts. In every art form it is associated with freedom from the restriction of traditional ‘artificial’ rules. German painter Caspar David Friedrich said “the artist’s feeling is his law”, an expression typical of the Romantic movement. Themes included folk art, emphasis on emotion and imagination, embracing the exotic, untamed nature and the aesthetic appeal of nature. The Romantic era in ballet is considered to have begun in 1827 with La Sylphide, the story of a young man visited by a fairy. Many Romantic ballets focus on themes of the supernatural, exotic places, and the conflict between man and nature, reality versus fantasy, good and evil. To take La Sylphide as an example, main characters include a fairy – the sylph – and a witch. It is set in Scotland, considered an exotic location to the French court of that time. Finally, while the young man, James, cannot join the sylphs world, she cannot live in his either. Tied in with these themes is the evolution of the dance language itself. The ballerinas portraying fairies, sylphs and willis needed to characterise a floaty, unearthly being. They moved and balanced on their toes and wore lighter, shorter, skirts. They stuffed cotton wool in their shoes and darned the toes to give support in their attempts to achieve a sense of weightlessness. Technical proficiency rose during this era, as with the shorter and lighter costumes women were able to perform more elaborate and difficult movements. This included greater leaps, in order to portray lightness. The removal of masks and headdresses allowed the face to become more expressive. To achieve the required ethereal look arms became softer, more rounded. A forward tilt to the body also developed, adding to the willowy look. Celebrated ballerinas of the era embodied the Romantic ideals. Fanny Essler was famous for her dramatic and sensual dancing. Carlotta Grisi premiered the role of Giselle. Fanny Cerrrito was famous for her lively style. Lucille Grahn was most famous for her portrayal of La Sylphide, which was in fact choreographed for Marie Taglioni. Taglioni was famous for her lightness and lyricism. 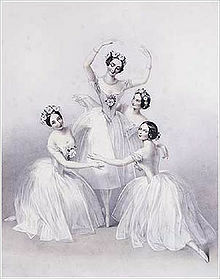 Four of these five (Fanny Essler declined) danced the Pas de Quatre, a divertissement, choreographed in 1845 by Jules Perrot, considered to be the epitome of the Romantic dance style. They were some of the first international dance stars. Ballet became wildly popular throughout Europe in the 1830’s and 40’s and the celebrated ballerinas were the film stars of their day. Within a few decades ballet had changed utterly. What we consider characteristic of ballet had developed. The short light dress, dancing en pointe, strong storylines with themes of good versus evil, supernatural elements, ever greater leaps, the illusion of weightlessness, sensuality and dramatic performance are all part of our conception of ballet today. Most particularly, men were all but removed from the stage. In ballet’s earliest days women were not allowed to perform. Now they were preferred. As fewer men were required to perform, fewer studied ballet, leading into a downward spiral of men’s participation in ballet.